“One of the greatest films of all-time that’s been imitated but never duplicated, The Godfather (1972), based on Mario Puzo’s novel, is one of the greatest crime stories ever told.” It would be difficult to coin a more appropriate phrase when discussing The Godfather. I recently watched this film for the first time, and it is easy to say that watching it is one of the best cinematic experiences one could encounter. The rise of the gangster film began in the early 1900s with films such as The Black Hand (1906), a silent film which tells the story of a “good immigrant”/”bad immigrant” collision. Since this, the gangster film has been vital in the rise of American cinema. 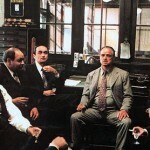 The gangster genre has taken off in many directions and mainly focuses on immigrant mafia gangs or families, such as the Corleone family as seen in The Godfather. Walsh’s 1915 film Regeneration represents Irish immigrant gangs in New York, where a young orphaned boy, Owen, grows up and joins the violent gang. His reasons for joining the gang are a direct result of the oppressive conditions he is exposed to in his childhood. The Corleone family are a far cry from the oppressed orphan, as they have become very wealthy from their mob life. The Godfather is also very focused on family values and, as a result, the family has become as “important as the government” in New York. The opening scenes of the film introduce the power of the Corleones, as family members call on favours they need from the Don. He has the ability to make his family’s wishes come true, as seen in his godson’s request to land a role in a film which, he believes, will start his acting career. When the film producer finds the head of his $600,000 racehorse in his bed after initially refusing to give the part, the film brings to light the “actions speak louder than words” rule which the mafia strongly live by. Refusal to the request of Don Vito results in a violent confrontation that will quickly lead to a resolution. Despite the violent actions the family takes in the film, there are many aspects which make the family very likeable. Don Vito is a man who sends people to do terrible things, yet he fondly plays with his grandson in his garden as an old man. His family are always his priority, and Brando superbly portrays Don Vito as a proud father on his daughter’s wedding day – a marriage which takes a disturbing turn as Connie is subjected to domestic abuse from the hand of her new husband. Michael (Al Pacino) eventually avenges this abuse, and once again the audience learns that nobody will get away with the mistreatment of the Corleone family. Michael becomes a full member of the family business and becomes the head of the family after the death of his father. He was not involved in the family business for many years, but, in compliance with the values of his family, he defends the Corleone name after the attempted assassination of his father – thus proving that the mafia blood runs in his veins, he cannot deny who he is. 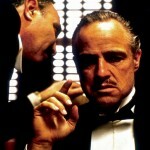 Having not seen The Godfather was a sin I had been guilty of for too long. From the opening scenes to the end credits, I was fascinated with every aspect of this film. You experience every emotion possible while watching it: fear, happiness, sadness, anxiety and many more as you watch the family rise and fall and rise again to become the most revered family in New York. ← Wanna hear a scary story?